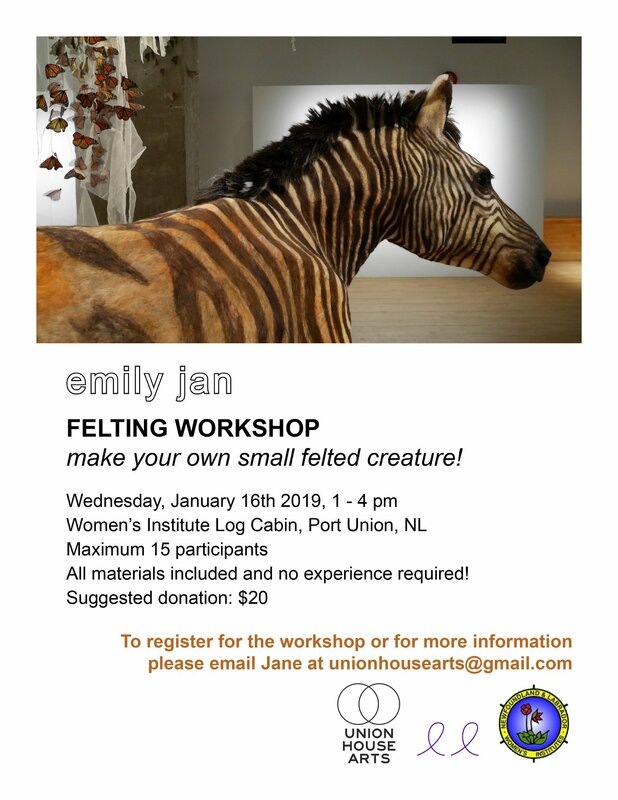 Eastern Edge is happy to be partnering with Union House Arts to present a Felting Workshop with artist Emily Jan! Join us on Wednesday, January 16 from 1:00-4:00pm at the WI Log Cabin for a workshop on making your own small (unlike this massive zebra!) felted creature. No experience required and all materials are provided. The workshop cost is pay-what-you-want, with a suggested donation of $20 to cover costs and to help UHA as we set to open our new space this summer. Email Jane at unionhousearts@gmail.com to save your place! Emily’s exhibition The World is Bound by Secret Knots opens this Friday, January 11 at Eastern Edge and runs until February 15. We are so grateful to be partnering with Eastern Edge and the Port Union-Catalina-Little Catalina Women’s Institute to present this workshop.